It’s Here! The Pyro South Seminar is Saturday, April 22nd in Cerritos, CA! It's Here! 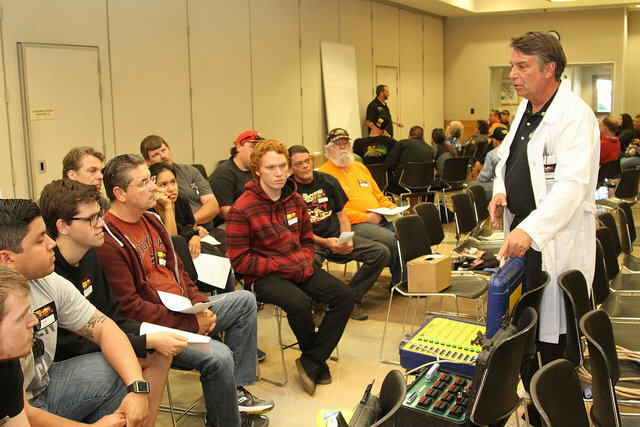 The Pyro South Seminar is Saturday, April 22nd in Cerritos, CA! Please join us on Saturday, April 22, 2017 for our annual Pyrotechnic Operator Seminar to be held at Cerritos Park East, 13234 166th Street in Cerritos, California. Registration begins at 8:30 a.m. with the Operator Seminar beginning promptly at 9:30 a.m. and runs through 5:00 p.m. The cost for the seminar is $20.00 per person, lunch is included. Cash or check only. This seminar promises to be exciting and informative; you will learn the latest on Special Effects and Theatrical Entertainment with the use of proximate pyrotechnics, flame effects, and cryogenics. We will have a BBQ at the Cerritos Sports Complex, 19900 Bloomfield Ave, Cerritos, California at 6:00 p.m. for operators and their immediate family. At 8:30 p.m. there will be a special fireworks display in celebration of YOU the Operators who make it happen every 4th of July. We will be having a Pyro 101 class at a later date, it will not be held at our seminar. Please, remember to please bring chairs or blankets to watch the firework display. Previous PostWoohoo! The 2017 Washington & Idaho Operator Training Seminar is Here! Next PostThank you for a wonderful Pyro North Seminar! Years of Service Awards, Best Truck Awards and More!